I wanted to say some very big thank yous. First for all the lovely comments on my last post and secondly to Chrissie for sending me this very sweet handmade tote bag from her give-away. I was able to choose the blues to go with my May flowers. It's very neatly made. Lovely fabrics, lace and a pretty polka dot lining. Tucked inside some Zinnia seeds for the garden, which I will endeavour to grow! Now when I saw the bag in the picture I was sure Chrissie had printed a label of some kind and was a little amazed to see that the 'life is one big WIP' is infact embroidered. It's lovely work Chrissie, thank you. have a happy bluish may!!!! What a wonderful giveaway, congratulations on winning it. I too am enjoying the sunshine, makes a nice change from the rain. What a beautiful bag. Blues are my absolute favourite and they make my heart sing. 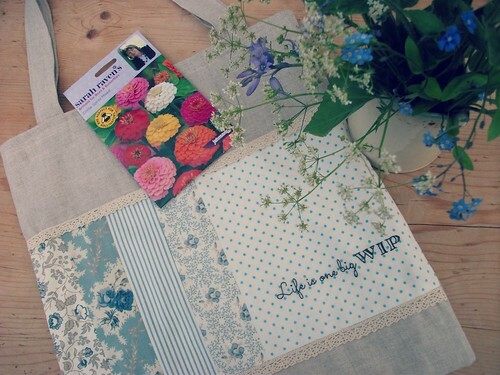 Such a pretty bag and your spring blue bouquet is lovely. After all the heavy rain yesterday it feels extra special to see the sun today. Enjoy the rest of your week Heather. Such a lovely bag, Heather, congratulations on your win and I'm sure you're going to enjoy using it! I hope the zinnias bloom beautifully for you, and I do like your pot of blue! 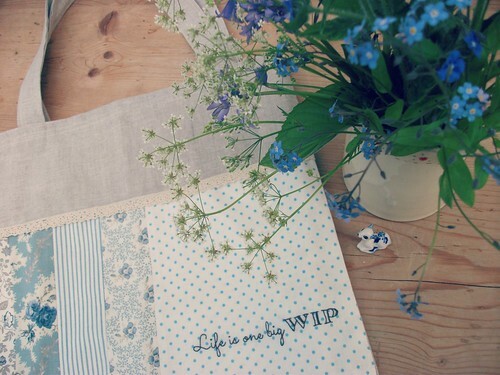 Love the bag and the pot of blue flowers. Have happy sunny days. 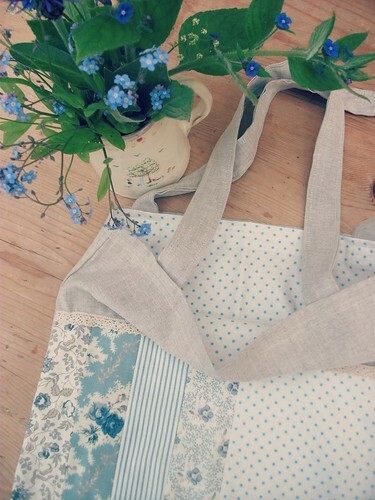 What a lovely bag and perfect with your Forget-me-nots. Super bouquet! 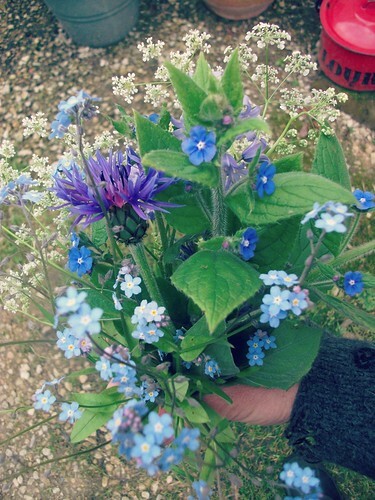 Forget-me-nots are wonderful! Just dropping in to say thank you for popping in to me lately! I bought a packet of those seeds. They are very easy to grow, and I planted them out into the garden last week. The bag is lovely too. Good morning Heather! I have only just read your previous post and it touched me enormously and I imagine it touched a lot of your readers. Years ago when I first moved to France as a full-time working single mother I arrived at one of the companies I worked for, stopped my car at the security check, gave a smile and a good morning to the lady behind the window and, do you know, she came out and gave me a hug. I imagine I felt pretty similar to you in the supermarket on your peony birthday. Those tears which well up are good tears.